7 Letters, 7 short films from 7 local film-makers, some of which I will love to work with one day. 7 is the magical number in the Harry Potter world, and this applies to the close-to-heart simple stories presented to the audience too. The different stories made us look at Singapore at different angles, without any political propaganda. Some are subtle, some are nostalgic, some are just simply sweet. This is an entertaining break as compared to the musical and nostalgic Cinema. Letter 3: K Rajagopal – “The Flame” is a simple story revolving 4 actors about their decision to stay in Singapore instead of moving to Britain. Starring T. Sasitharan, N. Vighnesh, Nithiyia Rao and Fatin Amira, one might find the pauses a tad too solemn, stark contrast from the previous funny “That Girl”. This is actually the director’s personal story, how his parents’ decision to stay in Singapore following the British’s withdrawal from the newly independent country changed his life. Although it is not the strongest film, the personal touch, the subtle mention about racial cohesion made this story emotional. Letter 4: Boo Jun Feng – “Parting” is a very very touching and sad story. I love the performance of J.A. Halim, the Malay man with slight dementia, crossing the Causeway to search for his love back in the 1960s. Perhaps I do see myself sometimes taking the public transport, looking back and thinking about the past. The subtle helpless look on his face when he thought he had found his love, only to know that she had left Singapore, and the dream-like scene when he revisit several spots in Singapore, as well as the now-defunct Tanjong Pagar Railway Station and meet his younger self, acted by Suria actor Ashmi Roslan who passed away in mid June 2015. Letter 5: Tan Pin Pin – Pineapple Town has a very interesting opening. The HDB flats do look like pineapples, and I was surprised as I’ve never seen Singapore from this point of view. But yet, the Pineapple Town was not referring to Singapore, but a small town in Malaysia. My friend’s comment on how Singaporeans adopting kids is a common situation but not often delved into, made me re-look into this story. Ning (Lydia Look) adopted a daughter and tried to search for the birth mother, but in vain. Years later, she brought the daughter back to the “Pineapple Town” which she believed to be where her adopted daughter’s real mother is. I like how she included certain angles (such as the final scene taken from a moving vehicle) which provide the audience with an allusive thought that, maybe, just maybe, she never had to search for the mother as she has always been around. 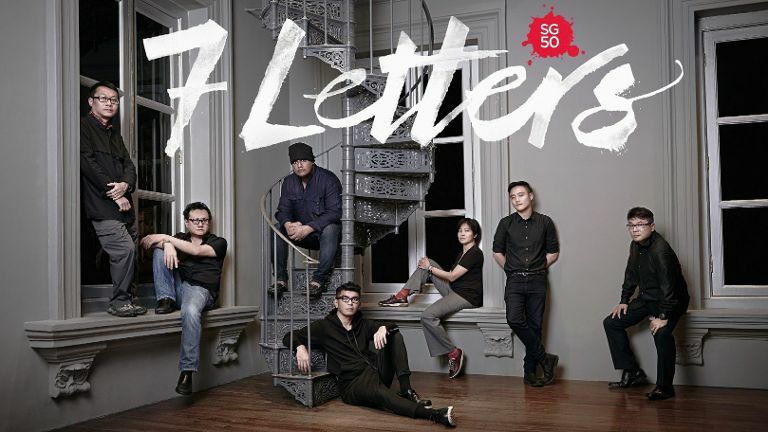 Letter 6: Royston Tan “Bunga Sayang” is an interesting musical which take place within 2 flats. While the short film revolves around the song “Bunga Sayang”, with imaginary and amusing, imaginary Music Video set, what I like most was the interesting but realistic interaction between the Chinese boy (Ray Tan Liang Yu) and his kueh-making makcik neighbour (J. Rosmini) who lived directly above him. The innocent yet attempt to communicate with the Malay neighbour by using hand signals and his “kosong” (zero) Malay language, the story reminded us about the true beauty of music – it connects people. Letter 7: Kelvin Tong “Grandma Positioning System” is my favourite story amongst the 7 (That’s why people save the best for the last?) Perhaps it is the film I could relate to the most, the film talks about how a family who travels to Johor every year during Qing Ming festival to pay respects to his late grandfather.The boy’s grandmother (Zhang Jin Hua) insists on spending a long time describing the changes in Singapore to her late husband during every visit, much to the chagrin of her family. The frustration of having to take a long car journey back, the addiction on our IT gadgets, these are some of common sights which almost everyone can relate to nowadays. I love how Kelvin Tong was able to use a similar set of lines to trigger two different emotions each time. The first time was amusing, but the second time will get you burst out crying within seconds. This tearjerking moment is so strong that I am affected just by the thought of it while typing this now. Although there weren’t much of the “olden setting”, a huge amount of research work is done on just that “GPS” directional guide-lines! 7 Letters is fully supported by the Singapore Film Commission (SFC) and has been selected as the Opening Film at the iconic Capitol Theatre in July 2015. Local director Kelvin Tong was doubtful of the idea initially to shoot the short film as he hadn’t done one for many years (His last short film was Moveable Feast in 1996). But he took up the opportunity as it was “a chance too good to pass up”. All 6,000 tickets to these premiere screenings were snapped up within two hours. Three additional screenings of the film were added from Aug 8-10 at the National Museum of Singapore’s Gallery Theatre. But they were also fully taken up. Due to popular demand, Golden Village will be screening the film from 20-26th August. The directors were given full creative freedom to fully express their feelings and messages in the film, without intervention from MDA. While each was allocated a budget to make their segment of the film, the directors individually topped up any excess needed for production of our films, as the aim was to make the best piece of work they could. Of all 7 segments, Jack Neo’s and Eric Khoo’s segments received the most cuts due to the length. Check out 7 Letters official website and Facebook Page! 7 Letters will be screened across 7 Golden Village Cinemas from 20 to 26 August. Tickets will be available from 5 August onwards. Head over to www.gv.com.sg for more information. Normal ticket prices apply and all proceeds will go to the 7 beneficiaries that our directors have selected. I watched this film yesterday at India Habitate Centre,New Delhi.and also intract one of the director K.Rajogopal.today i searched all about this film and found your review.It’s intresting.and something semiler,what I think abot this film. this is interesting moview to watch .. it’s like buy one take the other 6 films. i like this and i must see this one. It’s been years since I’ve seen a movie just like, this reminds me of my friend who loves short films. I feel that I cam relate more to this type of local movie. It reminds me of my childhood and also some of the things that we go through daily without realizing it. Its like mirroring certain part of our life. I like Letter too, some Singaporean are actually Malaysia before and majaority from Johor. This sounds like a pretty interesting film! 7 directors 7 styles 7 stories. And 7 charities too. Cool. I like the concept of having several letters tell the story of the movie. This looks like a great watch. I have read about it somewhere abut this short movie and it is perfectly made for SG50 to celebrate and spread the love across the country. I just watched the trailer and now I just can’t wait to see the whole film. It’s refreshing to watch short films once in a while, the Hollywood ones sometimes bore me and are too predictable already. Thanks for the review! Seven short stories in just one setting. this is so interesting. Wish I can find a copy of this one. So this is a local Singapore short film right? It sounds very great! Will search and watch it online. I kinda love the trailer and i can’t wait to see the full movie. Nice review. I like watching this kind of film because in just one sitting, I get to picture the culture and society of the people living in other nation. How long was the film’s duration? I would want to watch it if it gets screened here in Manila. I like to watch movies that depict the local culture and history. I hope this will be made available in our country so I can also watch this. I love watching short films, they have a certain truth to them that you don’t always see in big shot movies. This sounds really exciting, it would be a movie lover’s dream come true.